Say bye bye to obesity! In this age of fast lives with barely any time to work out, we can’t help but rely on fast food most of the time. However, many studies have proven that too much fast food plays a big part in becoming overweight and obese. Sometimes, we gain so much weight but barely even notice until one day we’re just staring at ourselves in the mirror thinking about what went wrong. To get back on track, there’s a safe and effective pill for you. Reducin (anti-obesity) is a 120 mg capsule of Orlistat, a gastric and pancreatic lipase inhibitor for obesity management. It works by preventing some of the fat in foods eaten from being absorbed in the intestines then excreting this fat through the stool. Along with a low-calorie diet and proper exercise, Reducin (anti-obesity) Orlistat can help you get back on track and lose all those extra pounds so you can break free from obesity, diabetes, triglycerides, cholesterol, other health risks and high costs. With proper diet and exercise, plus the help of Reducin (anti-obesity) Orlistat, you can truly reduce as in! Orlistat has been approved by the US Food and Drug Administration and European Medicines Agency. Orlistat has been widely used for more than 14 years in the USA and European countries. Orlistat is the first weight reduction medicine allowed to be used by teenagers aged 12-16 and also the first one to have over 100 million users around the world. Orlistat has also been proved with high effect on reduction of risks associated with obesity. Choose Reducin (anti-obesity) Orlistat. Choose your lifestyle, you deserve the best. Reducin (anti-obesity) Orlistat is recommended to be taken 1 capsule with warm water before every meal, or as instructed by your doctor. If a meal is missed or contains no fat, the dose should be omitted. At SRP P29.50 per capsule, get on the right track in weight loss. 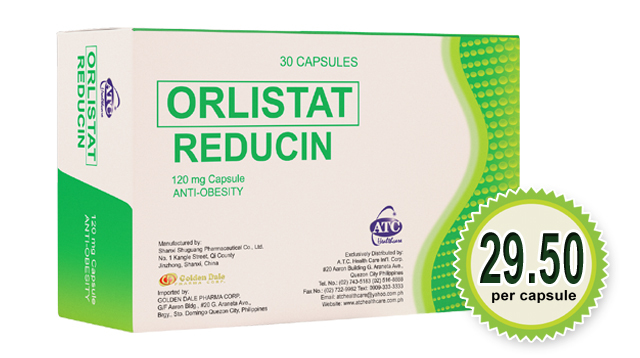 Reducin (anti-obesity) Orlistat is available at all Mercury Drug stores and other leading drugstores nationwide. Want to win an iPhone 6? Join the Reducin promo by Liking their Facebook page. For inquires, you may contact ATC Healthcare Customer Care thru these numbers: 516-8888, 0909-3333333 or 0917-5623333.